Nintendo Direct confirming the release of Majora’s Mask 3D, the great debate was whether or not the game would even see the light of day. Since then, there have been harsh words passed back and forth between fans who are in disagreement of the path that Nintendo has taken for releasing it on the 3DS, which Nate touched on a little bit yesterday. The fact of the matter is: we are getting this game on the 3DS, so there is really nothing productive to come from telling others why they are wrong. Instead, we can discuss the things that are still up in the air about the game that we are getting. Link‘s house in A Link Between Worlds to Zelda Williams carrying it out to Smashfest at E3 was just what we thought: a hint to the future release of Majora’s Mask 3D. But why did it take them so long to make it? What were they doing to a game that took a year to make that could possibly have taken three times longer to remaster? Well, there’s really more to it than just that. Majora’s Mask as a new game? Do we call it that solely because it presents us with a different story? The internet is riddled with gamers bashing on series like Call of Duty and Madden for being the same thing with a different face. But isn’t that exactly what Majora’s Mask was? They even confirmed that they used a lot of what was already created for Ocarina of Time to make it. At this point, I am already anticipating that some of you will skip the rest of this to write “How dare you compare Zelda with CoD!” in the comments, but hear me out. Year after year, the best selling games on the market are the ones that use a majority of the components from the last successful iteration. Majora’s Mask did just that and went on to be critically acclaimed as one of the best in the series, albeit not the best selling. How long do these “new” games usually take to make? One year. Ocarina of Time 3D offered very little change from the original. It was more accessible through an optional hint system but came equipped with Master Quest mode to provide a challenge to series’ veterans. Why would we expect much different from Majora’s Mask or even go as far as to demand it? While I wouldn’t be opposed to having more quests in the Bomber’s Notebook, I worry that adding too much will deteriorate from the perfect blend of content already in the game. If Aonuma added more quests, they may start to feel like a larger part of the game than the dungeons. If he added more dungeons, the quests would feel more tedious and mundane. We’ve already seen with Wind Waker HD that his focus for these side projects of remastering old titles is to simply remaster them and add a few new, fun, and accessible features. Like Nate said yesterday, we don’t want to take away from the importance of Zelda U.
Ocarina of Time 3D?” Simply put, I don’t know. It could be the lack of available staff to work on the project. It could be that they have been creating revamped dungeons for a Master Quest mode. What I do know is that this was the first title in the Zelda series that Aonuma was trusted with in its entirety. Now, he is in complete control of the remastering of that title and I know that he is going to take care of it as if it were his own child. Before, he was on a one year time constraint, but this time around he has been given time to let the developers breathe and take their time perfecting the experience that helped to shape his career in the industry. 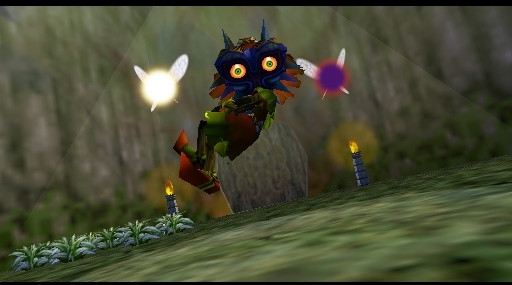 Majora’s Mask in a whole new way next Spring. Just remember that we want this to be a remastering of the game that we all remember, not a new game with similarities to the classic. 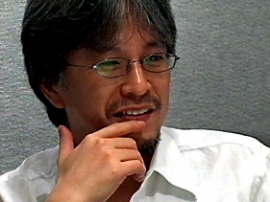 Trust Aonuma in what he is doing with the game. He has already given us Ocarina of Time 3D and A Link Between Worlds on the 3DS, so his track record on the system is solid. He knows how to perfectly blend classic and fresh elements and I have full confidence that the three years of development time will prove itself when Majora’s Mask 3D becomes the definitive way to experience the game.